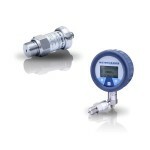 A pressure sensor measures pressure, typically of gasses or liquids. Pressure is an expression of the force required to stop a fluid from expanding, and is usually stated in terms of force per unit area. A pressure sensor usually acts as a transducer; it generates an electrical-signal as a function of the pressure imposed. Pressure sensors can also be used to indirectly measure other variables such as fluid/gas flow, speed, water level, and altitude. High speed changes in pressure is usually captured by using piezoelectric-materials (such as quartz). Types of sensors: Absolute (pressure relative to perfect vacuum), Gauge (pressure relative to a given atmospheric pressure at a given location), Vacuum (pressure LESS than atmospheric pressure), Differential (the difference between two pressures introduced as inputs to the sensor) and Pressure Switches ( simple on/off output when the set-point has been reached).